Radial Engineering announces the JDX Direct-Drive, a guitar amplifier simulator that also acts as a direct box. Line 6 offers users of the POD HD multi-effect pedals a new firmware that adds new amp modelings. Thomas Blug announces that its AMP1 guitar amp pedal has entered production and is available for pre-order for a special price. Although most amp modeling is digital, Tech 21 has always created its amp emulations using analog circuitry. The Hot-Rod Plexi pedal ($179) is the latest example. It’s an effects processor that’s designed to be used with an amp, so unlike the SansAmp processors, it has no speaker emulation built in. Mojo Hand FX introduced at NAMM 2014 several new pedals, including the all-new DMBL Overdrive. 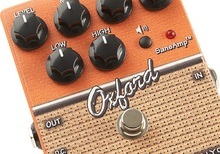 Tech21 launched the sale of its SansAmp Blonde Deluxe pedal, a limited edition available only on the manufacturer website. Line 6 introduces the next generation of POD guitar processor, the POD HD500X. Tech21 Private Stock expands with the addition of the SansAmp Blonde Deluxe, a limited edition that will only be sold by the manufacturer.